I’m trying to stick to my goal of multi-tasking while watching the Olympics, and so far I’ve been pretty successful. 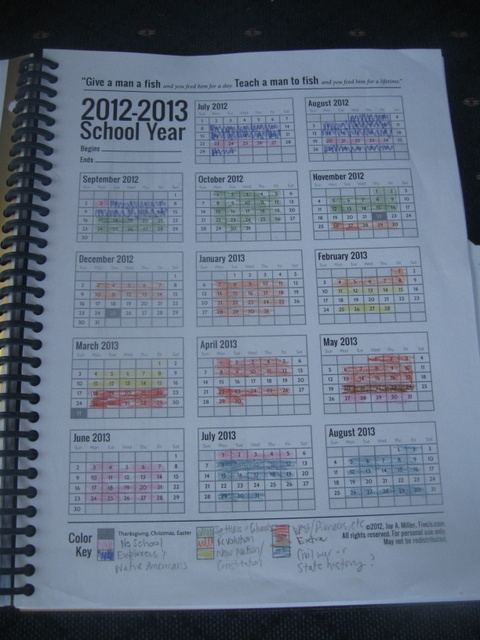 I’m super excited to have finished my planners for the 2012-2013 homeschool year! Yes…planners…plural! I posted a few weeks ago a bit about my planner from last year and some thoughts I had about creating a new planner for this year. (That post has links to a ton of free printables I found for creating planners, so be sure to check out that post too if you are working on creating your own!). The front and back covers start with a base of cardstock, and the front covers have a piece of decorative paper attached. I then sent front and back covers through my laminator. They are pretty sturdy yet still a bit flexible. I bound each one using my ProClick binding machine. 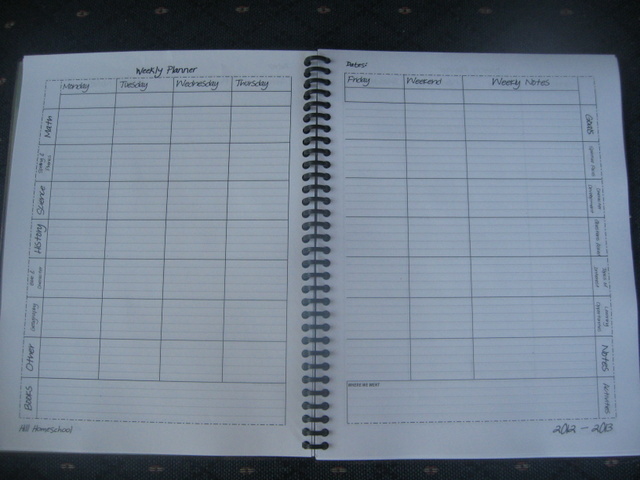 I love the ProClick because I can open these planners up and re-arrange or add/delete pages as needed! 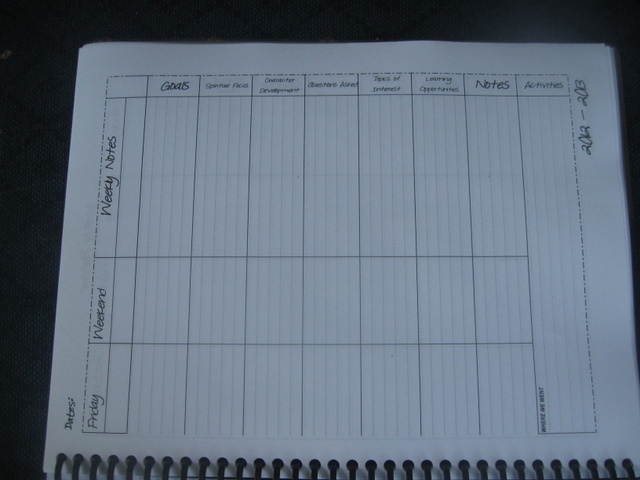 This planner doesn’t specifically have space for different students’ subjects. Some subjects like history and science we do “all together” anyway. The boxes are big enough that for subjects like Math and Phonics/Spelling I can write in the same box what each student is doing. This may not work when all 4 kids or even the three older ones are school age, but for right now with just a K’er and a 3rd grader doing “real” school, this should be just fine. 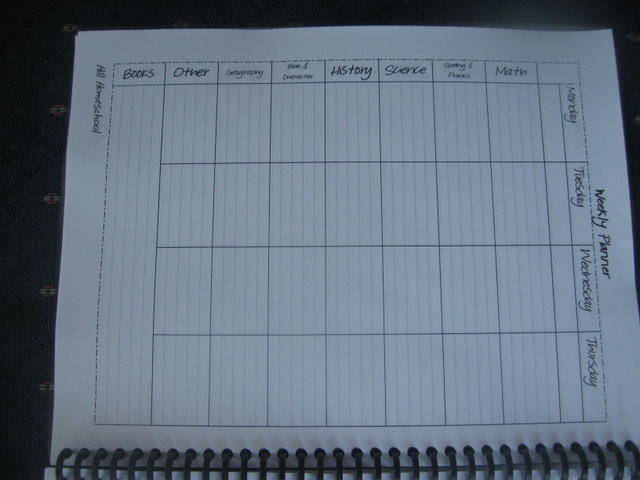 How I’ll use this is at the beginning of each week I’ll jot down in pencil what I hope to accomplish in each subject — which history books we might read, what math lessons I hope we finish (i.e. I will look through the upcoming lessons and see if any will take more than one day, etc). Then I can easily erase and make changes if needed! I can look back on the week as I am writing a weekly update post or as I decide what we need to do the next week! I like having this as a separate volume from my calendar/reference planner, because then I can have both open at once — one to a reference page and one to a weekly planner chart. I started out with a nice sturdy plastic pocket. It’s an Avery Big Pocket Insertable Plastic Divider. Since this reference planner is also my main calendar, I find myself taking it with me to appointments, etc and sometimes I have small bits of paper or appointment cards I don’t want to lose. That’s what this pocket is for! It used to have a tab divider sticking out the side but it stuck out way too far so I cut it off! 🙂 Under the pocket is a one-page academic year calendar from vertex42. I’ll use an (erasable) colored pencil to mark the weeks were planning on taking school breaks. Under the one year calender is a quick chart of “school weeks” vs. dates. We started doing some schoolwork at the beginning of July, but we won’t do “full school days” until after labor day (well, we might do a couple “for practice” the week prior to test out our schedule!). This only makes 32 full school weeks, but with the work we get done in the two months prior to this, it still makes for a pretty full school year. This reference will help me make sure we stay on track with things like Miss M’s Bible study book for the year, where we’ll just do one chapter per week. I can quickly make sure we are staying on track by comparing the week # with the chapter #! Under the chart is a set of monthly calendars, again from Vertex42. I used the school year calendar from 5Js to color each of our history units a different color for quick reference. 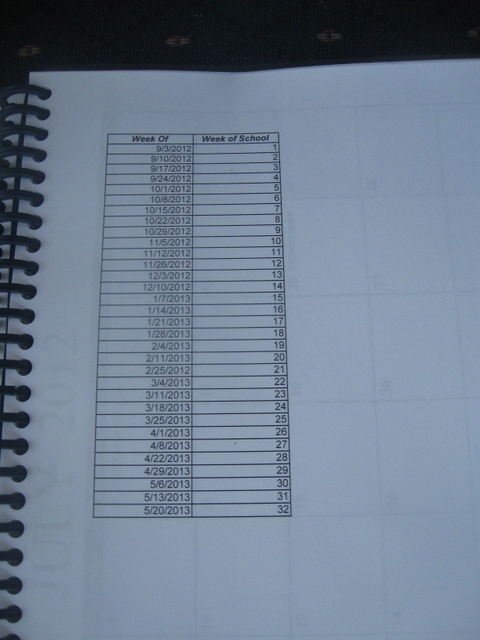 And I also printed out the most recent copy of my history spreadsheet (available on this page — I’ll be updating the file as we go through the year) for quick reference. I’ll be changing out these pages every couple months as I update the spreadsheet (I think, anyway!). If I find I always just look at this on the computer, I may take it out all together, but I suspect I might refer to this at the library or elsewhere. 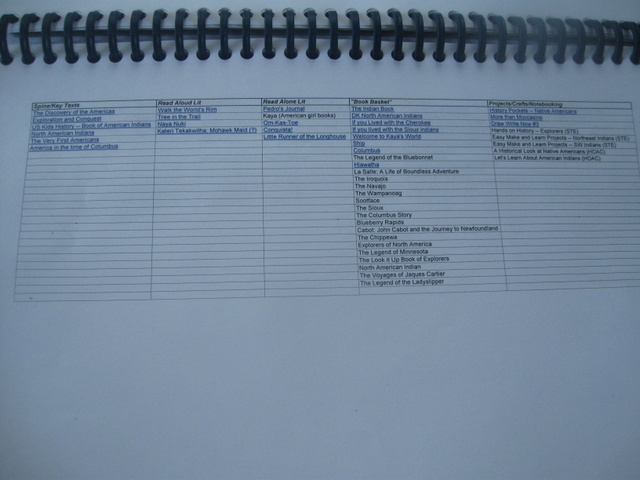 I’ll still be adding a few more pages to my reference planner, but it’s about 95% or more complete! Finishing the planner makes me really excited to get going with more of our school year! This is now closed. Kim (Comment #43) is the lucky winner. I’ll be sending Kim an email, and if I don’t hear back from her within 48 hours, I’ll select another winner. Thanks all for entering!!! Would you like to win all four of these items? Just leave a comment on this post! You can get a second entry by subscribing via email or RSS and then leave a comment letting me know that you subscribe! This giveaway is open to US addresses only. Entries will close on August 4th and a winner will be selected via random number on August 5th. 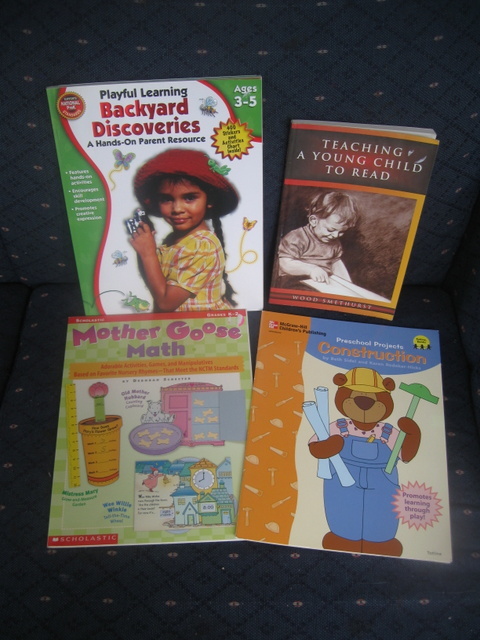 Be sure to visit the Curriculum Clean-Out link up and enter some of the other give aways too! Last weekend was a big “milestone” weekend — it seemed like all the boys were growing up a bit. 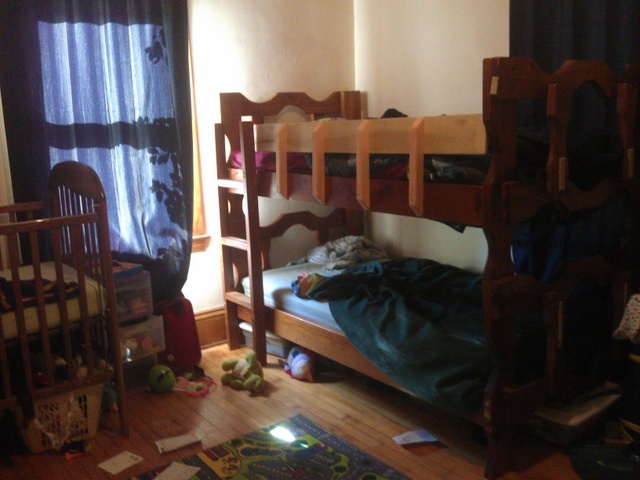 A co-worker of Tony offered us free bunk beds, and considering we had just been discussing building bunk beds for the bigger boys, we could hardly turn down “free” — all we had to do was buy mattresses and slats (and of course put them together, which was a little tricky since the beds weren’t originally set up to use Ikea slats…but still easier than building a bed from scratch!). With the boys moving into a bunk bed, Baby J could move in with his brothers! Over last weekend, Baby J also got his first tooth (#2 came in yesterday morning!) and we also moved him out of his “bucket” car seat into a regular convertible seat. He’ll be 9 months old next week…hard to believe, time is going by so fast! Other than those big milestones, we’ve had a lot of regular old summer fun the past couple weeks — playdates with friends and neighbors, trips to the pool and playing outside. And regular life stuff like trips to the dentist (twice for me, unfortunately since I had to get a cavity filled!). Miss M also went to my mom’s house for three days for her special one-on-one time with Grandma. 6. We tried homemade ice cream again, this time with an ice cream maker borrowed from a friend — I found this much easier and more satisfying than the make-it-in-a-bag method! Here the kids are enjoying their yummy cherry ice cream! 7. It’s a little hard to see this well in the picture, but this is a giant cardboard maze that filled up the entire gym of our neighborhood park rec center! A local artists puts on “cardboard camps” at the park where kids build amazing things out of cardboard. Various weeks’ projects include boats, castles, medieval weapons and this maze. Some friends participated in the cardboard maze camp and invited our kids to come to the open house. The kids all had a ton of fun getting lost, finding their way out and generally running around the cardboard maze. I hope they are still running these camps at the park when Mr. E is old enough, because I think he would really get “into” doing one! 8. and 9. We’re still mostly on summer break, but we are doing some history reading (no pictures of that), and spelling with Logic of English. Last week we did all of lesson 4 — in #9 the kids are enjoying a phonogram board game together. At the end of week wrote an entire story using her spelling words and dictated phrases…with no mistakes! That is huge for her! There were a couple words she wasn’t sure how to spell, but she knew she didn’t know how to spell them and asked for help before writing them down. Unfortunately after not working on spelling for a few days (due to the trip to Grandma’s house), yesterday’s attempt to start lesson 5 (an assessment and review lesson), produced a giant meltdown/disrespectful behavior and mistakes on words I know that Miss M could spell last week. Sigh. When she is thinking with a clear head, Miss M tells me that LOE Essentials is a great spelling curriculum. When she’s frustrated though…boy watch, out. I think we need lots of consistent practice…and continued discussions about both appropriate behavior during school time and how to communicate frustrations. Today we’re heading out for a “field trip” to a local historical site, and then we have a church conference this weekend. Hope you have a great weekend too! 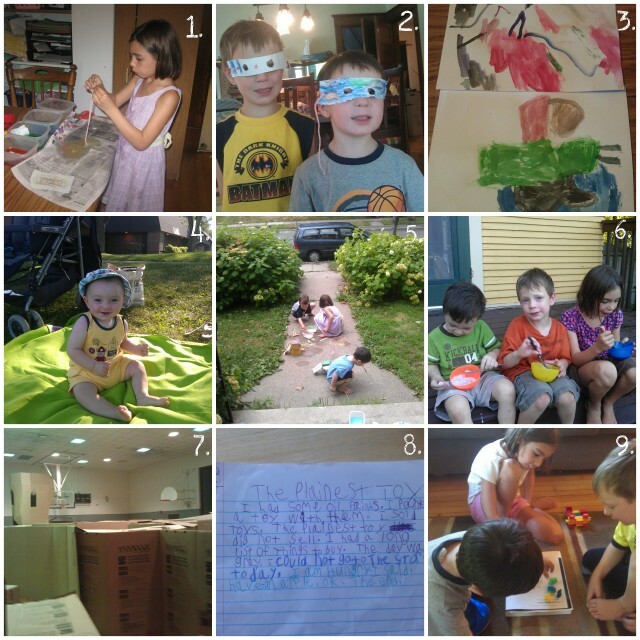 I’m linking up to Collage Friday and the Weekly-Wrap Up! I have a soft spot for vintage picture books. 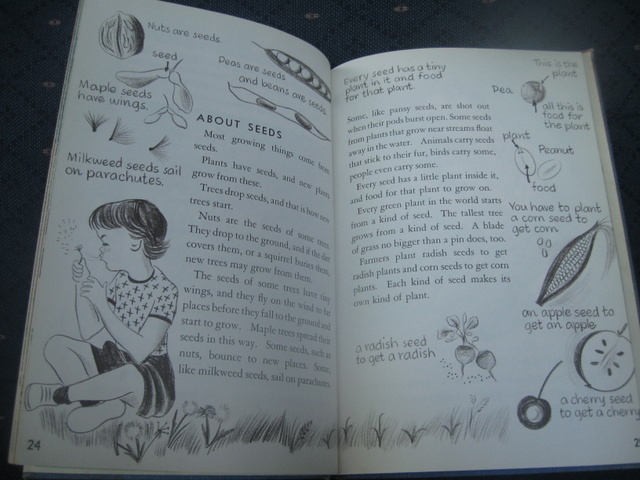 The older styles of illustrations from the ’50s through the ’70s really appeal to me, and while many classic books from that time and earlier are still in print and published in neat, shiny paperbacks or hardcovers…there is something even more charming to me about an old-smelling, well-loved copy. 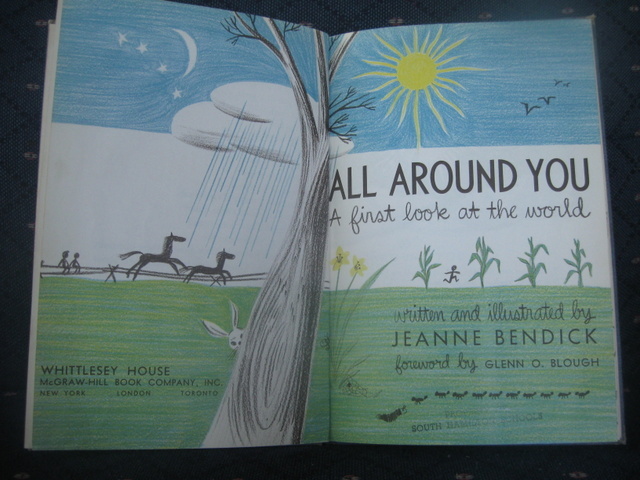 How High Is Up by Bernice Kohn, Illustrated by Jan Pyk is a book a received as a gift when I was a toddler. It makes me feel slightly old to classify a book from my own childhood as “vintage” — it really is. It was published in 1971 (I’m not quite that old…but it’s the right decade! 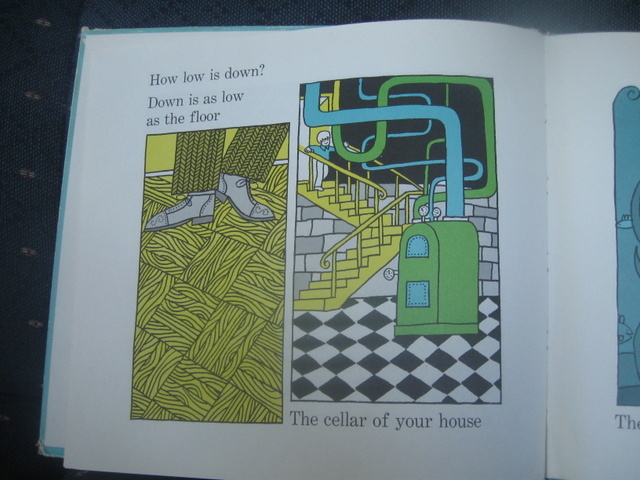 ), and the illustrations are classic ’60s/’70s style. I only own three books from my childhood, and this is the only one that I really remember. It seemed so familiar! When I found this book among my possessions after I had children, it brought to mind tastes and smell and warm fuzzy feelings of childhood. I would describe this story as peaceful and thoughtful — a great bedtime story. Questions like “how big is big?” and “how high is up” are answered not with precision but with vivid comparisons. So how big is big? Big is as big as a banana split (remember how huge those seemed as a child? 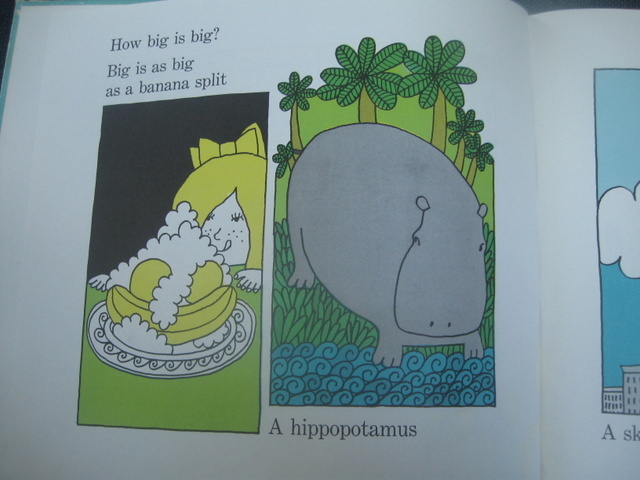 ), A hippopotamus, a skyscraper. Linking Up to…Read-Aloud Thursday @ Hope is the Word! Although I am typically pretty ambivalent about watching sporting events, I do get pretty excited about watching the Olympics. When it only comes around once every four years it feels like something worth rearranging schedule for (well, sort of once every two years if you count any Olympics…but of course once every four years until the same season repeats!). The last time we watched the Summer Olympics, we only had two kids! Mr. E was not quite a year and a half old! As much as I am excited about watching, I know I will spend waaaay more time in front of the TV than usual during the two weeks of the games. I decided to make the most of it by thinking of ways I can multi-task while watching. Given that we are speeding closer and closer to the start of the new school year, this seems like an ideal time to make some preparations! 1. Binding artwork and samples of last year’s work with my Proclick Binder. 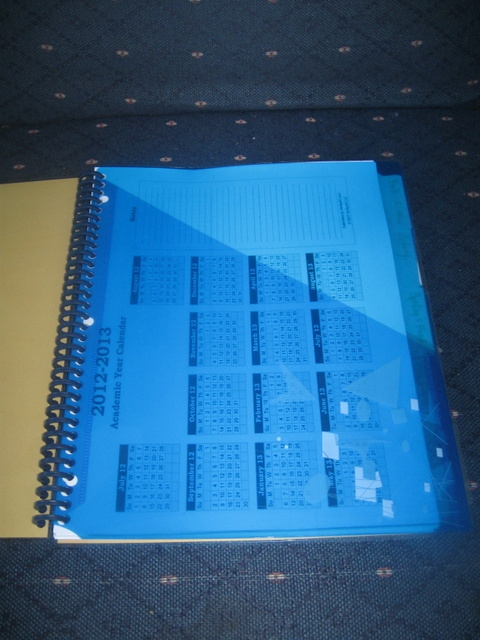 Zip, Zip back and forth with the binding machine, then feed the punched paper onto proclick spines. Mindless, and perfect to do while watching TV. Getting ready for next year means getting cleaned up from last year, too! 2. Print out the first several Animal ABC until from 1plus1plus1equals1.com for Mr. K. Laminate and cut where needed. While I am really very relaxed about preschool and don’t feel the need to follow a curriculum per se (I am not sure it is really even that high of a priority for Mr. K to learn all his letters this year!) — I know he is interested in letters and will want some “school stuff” to do while his big siblings are hard at work. 3. Prepare cursive copywork pages for Miss M. I decided to ditch A Reason for Handwriting level D (which I had originally planned for this year), and focus instead on copywork more directly related to Bible, history and other areas Miss M will be studying. I think i can handle some copying and pasting of Bible verses while watching the athletes. Then I can get the Proclick back out and bind those together too! 4. I might print and prep some Kindergarten Packs from 1plus1plus1equals1 and Kindergarten Kits from homeschool share for Mr. E — this would be fun supplemental stuff for him to do if he needs something “extra”. 5. 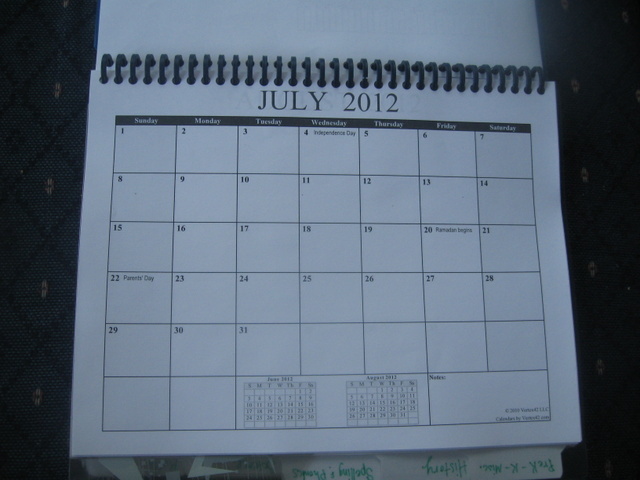 Consider a Calendar notebook of some sort for Mr. E and Miss M to do this year. I have a pinterest board with ideas for this. I am not 100% convinced I want to go this route, but if I decide to do, it this would be the perfect chance to prepare. 6. 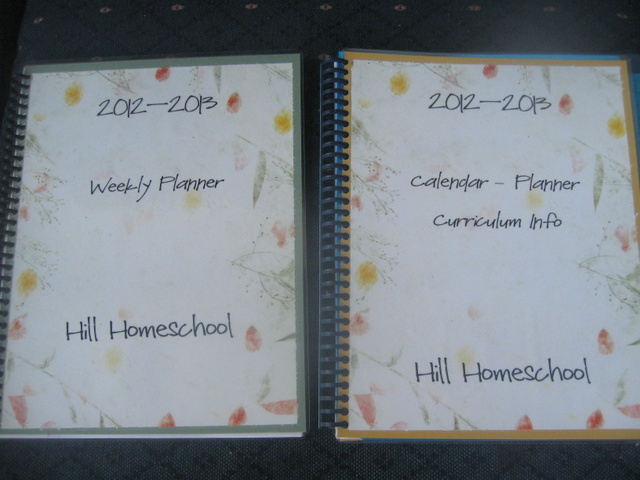 Organize the multitude of free downloaded homeschool products I have on two different hard drives, plus files I have stored at Currclick, Scholastic, etc but have never downloaded. It’s hard to make use of free/cheap files when you don’t even know what you have. This has been on my to-do list for a while. Maybe now I’ll finally get to it! 7. Once I have those files organized, maybe I will get ahead on printing out a few things I’m pretty sure we’ll use this year. It would be nice to have some history and science printables ready to go! 8. Find great stuff to pin to my new Building Foundations of Scientific Understanding (BFSU) Pinterest Boards. These are a group effort, but I want to add more quality content. 9. Work on my US History Year 1 spreadsheet — I want to link more of the books in my file to their amazon pages to make them easier for anyone else to find the same books! 10. Finish putting together my planner for this next year. I have it started, but it’s not done yet. I’m linking up with Top Ten Tuesday @ Many Little Blessings! I went to yet another book sale yesterday — this time it was the annual Half Price Books Tent Sale in St. Paul. Most kids books are $1 at this sale — not quite as good as the quarter-a-book sale I went to last week, but there were tons, and tons and tons of books to choose from. I came home with a number of titles from our general literature list and history read-aloud list for the upcoming school year, as well as some science titles for subjects our home library is lacking in. And of course a few random books. I just couldn’t resist delighting the boys with books about mummies, how things work, wars, and some Mr. Men/Little Miss books (those were only 25 cents each!). Miss M brought her own money and came home with a handful of Boxcar Children books, American Girl books and “A to Z mysteries”. I think I should be done with books sales for the rest of the summer though. Our books shelves are pretty overflowing at this point! Despite all the books I buy, I still end up having many, many book s checked out from the library as well. 🙂 One interesting book we brought home from the library a couple weeks ago is “The Little Island” by Margret Wise Brown and Leonard Weisgard. I read about this Caldecott-Award-Winner on someone’s blog…but once again I don’t remember whose blog it was. I think it was, again, probably someone who participates in Read Aloud Thursday! 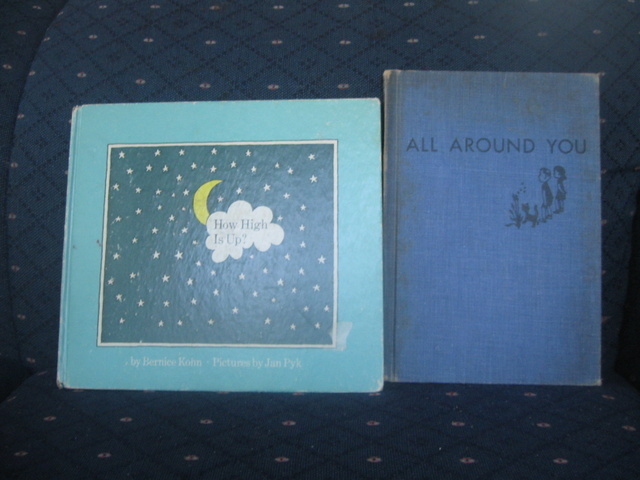 Brown is well known for her classic books Runaway Bunny and Goodnight Moon — tales that are probably on the bookshelves of most homes with toddlers. We also own Red light, Green light, but I’ve never seen any of her other books before this one. The premise of the book is fairly simple — a little island sees the seasons come and go along with the changes they bring in animals, plants and other aspects of island life. Weisgard’s illustrations are truly stunning, and I can easily see why this book won a Caldecott. The only thing that kind of threw me “off” in this book was a cat that shows up in the middle of the story, having arrived on a sailboat with its owners. The cat proceeds to have a conversation with the island and makes extreme demands of a fish to have the fish explain how the island is part of the land. Then the story returns to being a nice, quiet nature story about how the island changes through the seasons. Yep, a bit jarring to throw that talking cat in the middle of the story. All in all this is still a great book, and the boys said they enjoyed it. It’s the type of book in which you can savor every page, looking a the details in the drawings and talking about nature and geography. Visit Read-Aloud Thursday @ Hope is the Word to see what books other bloggers discovered this week! Collaborative Pinterest Boards for BFSU! I’ve been distracted the last couple of days by a new endeavor. I decided to act on my idea from my Top Ten Random Things post from Monday night and create collaborative boards on Pinterest for users of Building Foundations of Scientific Understanding (BFSU) by Dr. Bernard Nebel to share resources they have found with one another. BFSU is a great science curriculum in many ways. It is flexible, thorough and teaches real scientific thinking/understanding – not just memorizing random facts or vocabulary. On the other hand, it is definitely not an “open and go” sort of program. It takes teacher prep time to absorb Dr. Nebel’s material and decide how to present it. Plus there is the time involved to set up demonstrations/experiments and find any other resources needed — pictures, videos, printables, etc. I had a brilliant idea over the weekend (in my humble opinion). 😉 I thought to myself, why not harness the power of Pinterest to help users save time and easily share the resources they have found or created? So earlier this week I created 5 collaborative Pinterest boards on my Pinterest profile — One for each “thread” plus a general board for resources that relate to all or multiple threads. (Look to the second row of boards to see the BFSU boards). I’ve been spending a bit of time this week promoting the new boards among BFSU users, answering questions and adding both new pins and collaborators to the boards. But hopefully once the boards are up and running they won’t take much of my time — ideally they will save time as Tony and I plan our science lessons. What is Pinterest anyway? And what is “pinning”? Pinterest is essentially a “visual bookmarking” website. You can “pin” a picture with a description of a web page. 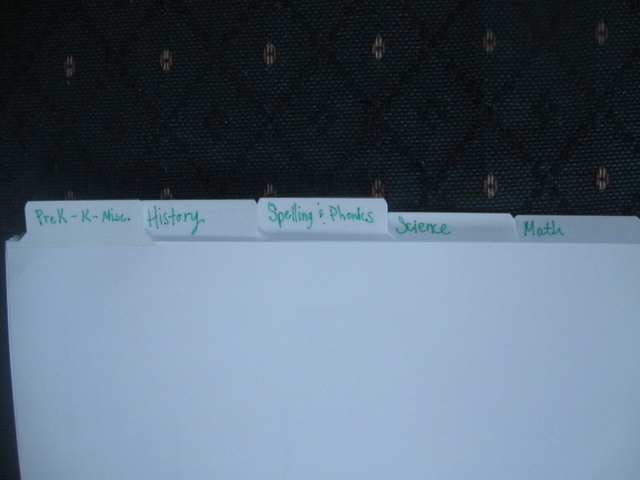 You can then organize those “pins” onto various “boards” (imagine like a virtual bulletin board) organized by topic or how ever you want to organize it. Then people who choose to “follow” you (or any one searching through the site) can see your boards and your pins. You can either pin something you find while searching the web or you can “repin” things that other people have already pinned (this just creates a copy of the “bookmark” for your boards/pinterest page). I love being able to glance through pictures from various things I have pinned (desserts from my dessert board, kids craft ideas, homeschool ideas, etc) and quickly find something I’m looking for. Will I find this useful if I use a science curriculum other than BFSU? Yes, you will! The only thing that won’t be very useful is lesson code designation in each tag (and maybe some BFSU specific lesson plans on the General board). But otherwise, Thread A is loosely Chemistry and some Geology resources, Thread B is Life Science resources, Thread C is Physics resources and Thread D is Earth/Space science resources. The ideas and resources pinned could generally supplement any curriculum. How can I help? How can I collaborate on your Pinterest boards? To collaborate on the BFSU boards, you first need to be a member of Pinterest (see next question if you don’t know how to do that). Next you should probably “follow” the board(s) you want to collaborate on. Then just leave a comment on one of the pins or send me an email with your Pinterest user name (kirsten @ tonyandkirsten dot org). I will invite you to be a collaborator and you will get an email from Pinterest saying you need to accept the invitation in order to be able to pin on those boards. Once you accept the invite, the BFSU boards will show up in your list of board options when you go to pin something. Don’t forget to put the lesson “code” in the text of the pin (C-7, A-3, etc) to make it easier for everyone to find resources related to a particular lesson. If you don’t want to join Pinterest but want to contribute to the boards, feel free to email me sites/pages that you think should be pinned or if you are a member of the Well Trained Mind forums, you can leave a comment in this thread with your pin suggestions. How do I join Pinterest? Do I have to have a Facebook account? You need an invite to join Pinterest. You can request one on the site (not sure how long it takes to get it) or you can request one from anyone who is currently a member. Feel free to email me for an invite. You do need either a Facebook or a Twitter account to get a Pinterest account. A bit silly, I know. If you are avoiding Facebook for whatever reason (and I know a number of people do avoid it! ), it is not very difficult and less invasive to sign up for a Twitter account. You can mark your Twitter profile as “private” and not add any or follow anyone, and this should be enough to get a Pinterest account. What if I don’t want to join Pinterest? Can I still see the links that everyone Pins? Yes, you can see the boards and pins and follow the links without joining.